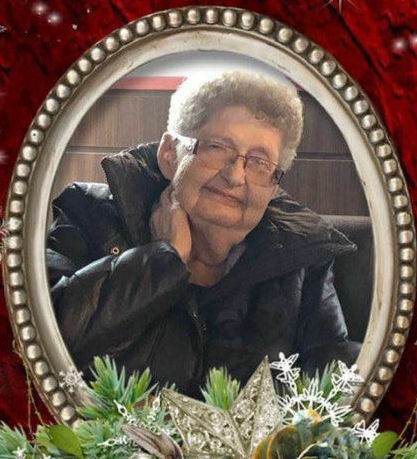 Obituary for Edna (Teddy) Irene McCue | Westlock Funeral Home & Crematorium Ltd.
It’s with heavy hearts we announce Edna Irene McCue (Sowles) passed away suddenly at Westlock hospital March 19, 2019. Edna was born August 13, 1936 in Surrey B.C to father Roy Sowles, mother Wilhelmina Frost from Michigan USA. Edna grew up on the west coast and worked as a cook most of her life. In 2002 Edna’s lifelong friend, Ruby introduced her to Earl McCue. Earl stole her heart and she moved from Berwyn AB to Rochester AB. Edna enjoyed camping, gardening, knitting, crocheting, bingo, playing cards, building puzzles, reading, and being surrounded by family and friends. She is predeceased by her parents, father Roy Sowles, mother Wilhelmina Frost, son Troy Chalmers, brother Bill and sister Pat. Edna is survived by her loving husband Earl, Sister Phillis Moon, her girls Linda, Eileen, Marsha, Debbie, Stepchildren Leonard, Carol, Donna, George, Grandchildren, Great grandchildren, In-laws Sharron, Allan, and Bob. A memorial service will be held on Wednesday March 27,2019 at the Rochester Senior Center at 2:00pm. With lunch to follow. Westlock Funeral Home & Crematorium Ltd. 780-349-3474.